The City understands that there are concerns about access to businesses during the Livernois resurfacing project (June-November 2018). While road improvement projects always create temporary conditions that require some patience and understanding, we’re working with the business community to identify challenges and create solutions that can ensure as smooth and safe a process as possible. 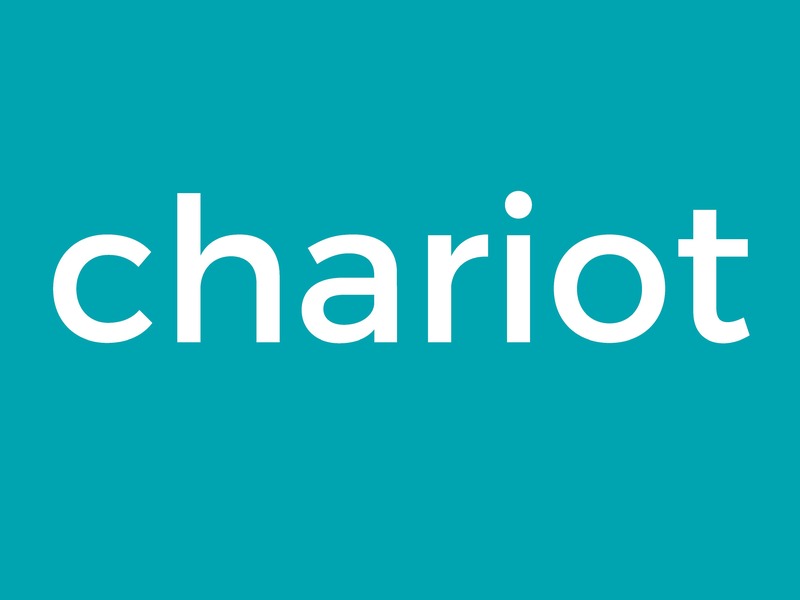 Provide convenient access to employees, clients, and customers with complimentary valet. Using local Star Trax Valet, visitors and employees can visit Livernois businesses for FREE during construction. Valet is available for all businesses and the drop off location is at Axle Brewing's Livernois Tap (567 Livernois). Current valet hours are Thursday & Friday, 6 p.m. - 10 p.m. & Saturday, 11 a.m. – 11 p.m. Launched: June 7th. Thanks to shared parking agreements and a temporary street parking allowance on Fielding St., additional off-street spaces will be available for use by employees, clients, and customers at the Kulick Community Center (20 spaces), Ferndale High School (whole lot except row against tennis courts),150 Livernois (8 spaces), 914 Livernois (10 spaces), and on-street spaces along E. and W. Fielding St. Check posted signage for parking hours. Launched June 11th. Help your visitors and employees get to Livernois without disruption by offering a pre-paid Lyft code worth $7 off 4 rides for the entire month of November: LIVERNOISNOV. Available on a limited first come, first serve basis. Pick-up and drop-off locations are conveniently located at Axle Brewing's Livernois Tap (567 Livernois) and Ferndale High School. 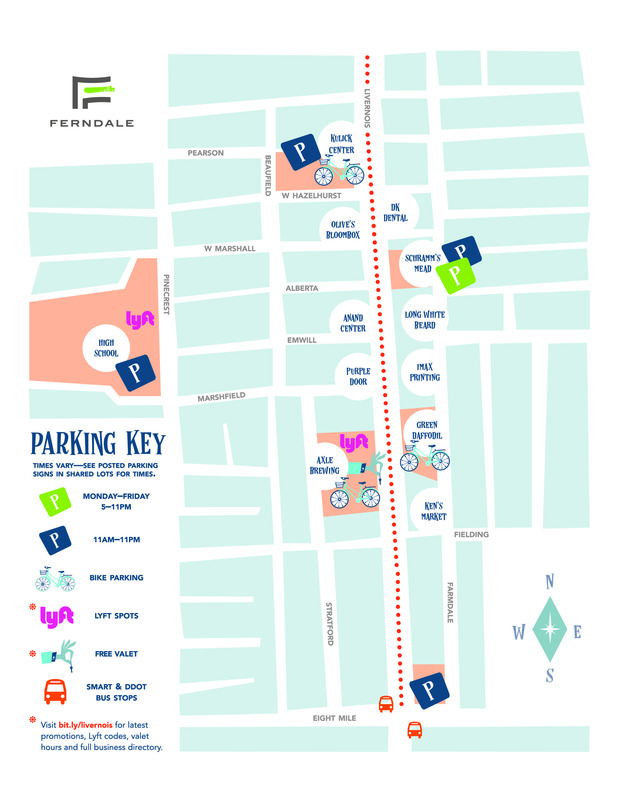 Either ride directly to Livernois or park at Ferndale High School and catch a Lyft ride to the corridor. 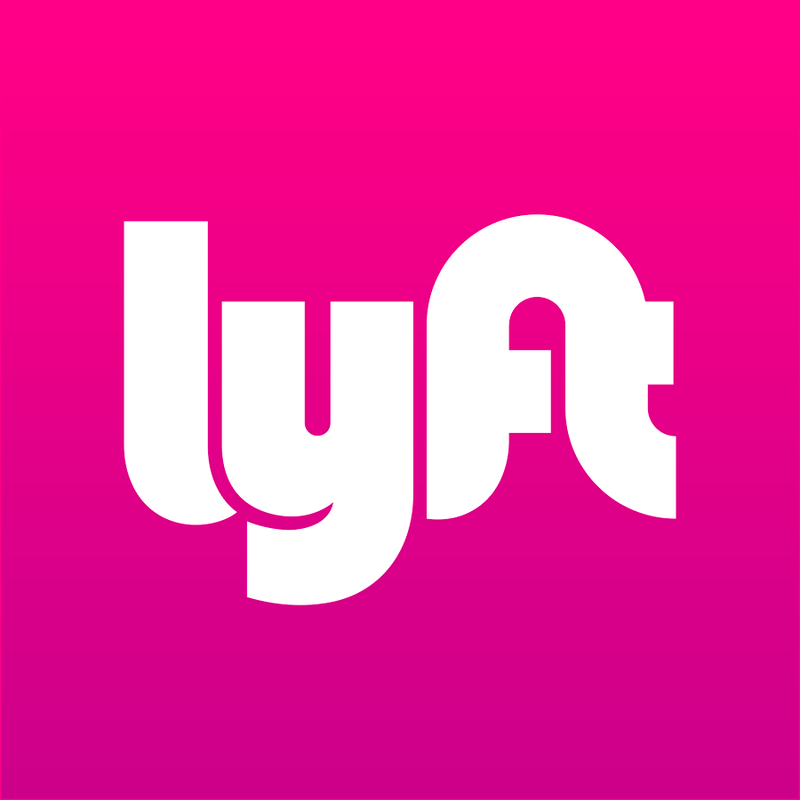 Lyft codes are available to businesses and visitors to Livernois. can be applied using this link or entered directly into the app (instructions here). Launched July 1st. To view an online map with all Livernois businesses, click here. If you have questions about these or other temporary parking solutions, please contact the City’s Community and Economic Development Department at 248-546-2363. Celebrate your city by shopping local! Join us for the Third SoFe District Stroll down Livernois in Ferndale! 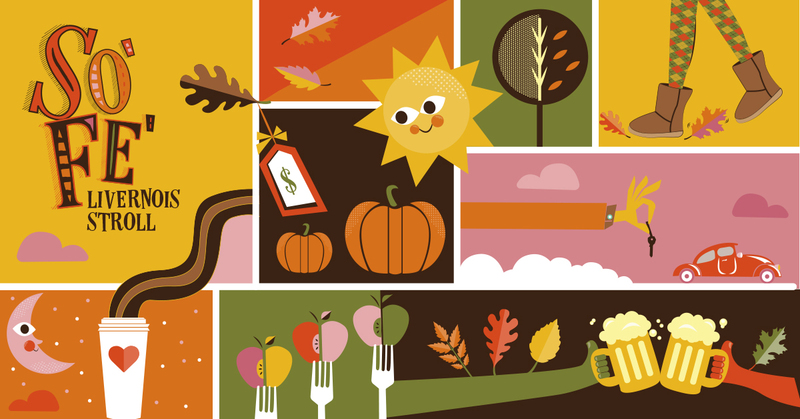 - Green Daffodil: We will have in-store specials and cider and snacks. Drifter Coffee will be dishing out donuts and cider on 10/13 & 11/24. As always, stop on by to play with our lovable kittens! 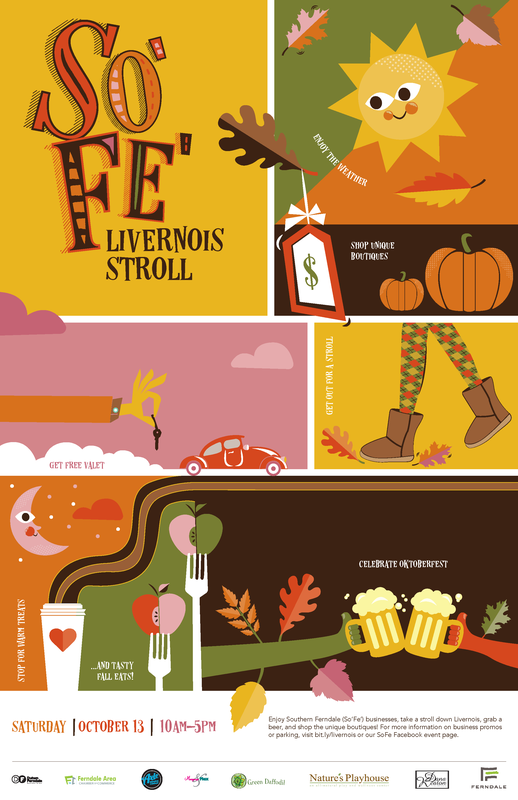 - Axle Brewing’s Livernois Tap: Stop by to celebrate Livernois Tap’s second annual OKTOBERFEST. Tickets can be purchased in advance using this link: https://www.facebook.com/events/214713472572094/. What: SoFe District Livernois Stroll? It is an event geared towards drawing in customers and promoting Livernois business during construction. The event received its name from Green Daffodil wanting a clever term for "So-uth Fe-rndale" for the Livernois Corridor. Saturday, November 24. * 10 a.m. –5 p.m.